1 one eighth inch Hex Brute Turbo Electric Breaker Kit Rental – Bosch BH2770VCD , is available for rent in Rochester NY, Ithaca NY and the entire Western New York region from the Duke Company. 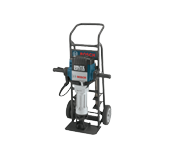 The Bosch BH2770VCD 120V 1-1/8 Hex Brute Turbo – Deluxe kit is featured by its impact energy of 47 pounds which provides maximum concrete removal and its anti-vibration system. The kit includes: deluxe hammer cart, two star point chisels and two narrow chisels.